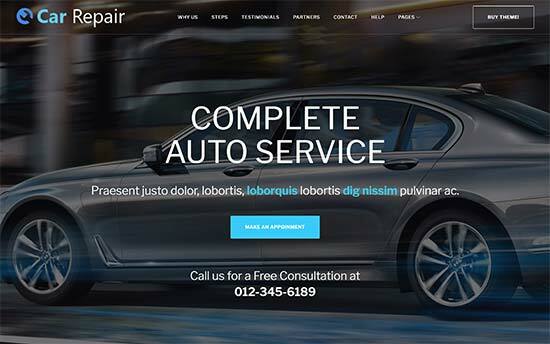 Trying to find the best WordPress themes for car dealerships? 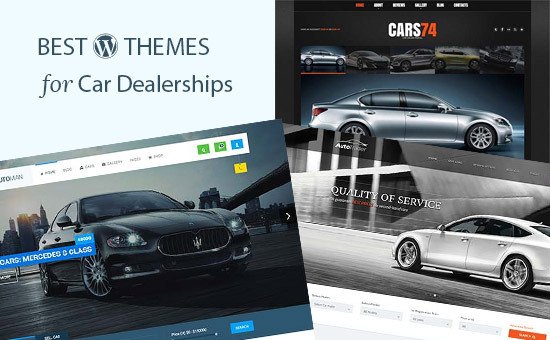 While there are thousands of WordPress themes out there, it can be difficult to find one that lets you showcase your car dealership. In this article, we will show the best WordPress themes for car dealerships that you can try right away. Thousands of businesses, including some big name brands are already using WordPress to run their websites. It is also a popular choice among car dealerships. Before getting started, make sure that you are choosing the right platform. A self-hosted WordPress.org site will give you access to all features of WordPress (see our comparison: WordPress.com vs wordPress.org). Self hosted WordPress sites need a WordPress hosting account and a domain name. We recommend using Bluehost. They are one of the top WordPress hosting companies and an officially recommended WordPress hosting provider. Once you have signed for hosting, head over to our how to make a website guide for step by step WordPress installation instructions. 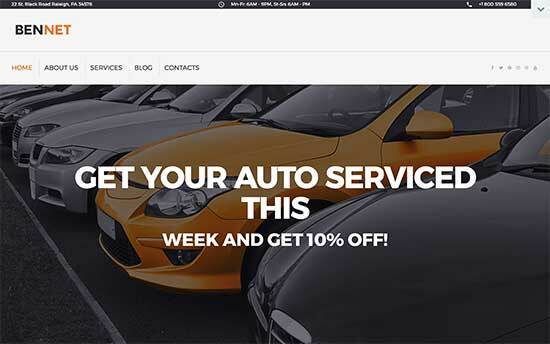 Once you’re ready, let’s take a look at some of the best WordPress themes for car dealerships. 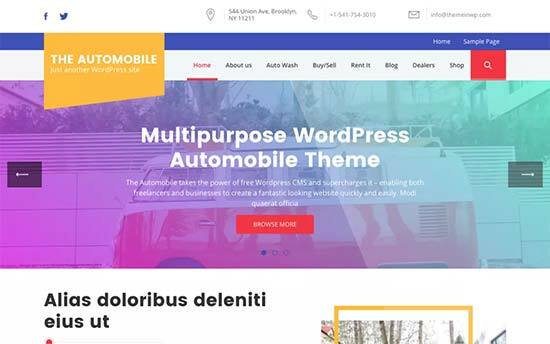 Motors is a WordPress theme beautifully designed for car dealerships, used car dealers, and other automobile businesses. It has 6 ready-made website templates that you can install with 1-click. It also includes a powerful search and filter feature allowing users to easily look for cars and vehicles of their choice. Other noteable features include dealer pages, Google Maps integration, sell your vehicle forms, and more. It offers an easier theme setup with custom options panel with tons of customization features. 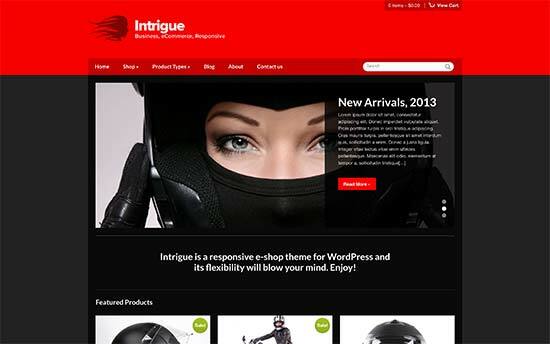 Intrigue is a beautiful WordPress theme with a bold color scheme and modern stylish look. It comes with a default red and black color scheme that gives your car dealership website a unique look. It is designed to be a multipurpose theme suitable for all kind of businesses including car dealerships. If you don’t want to use bold colors, then it also has other color schemes that you can use right away. It has an easy to setup homepage, custom widgets for Twitter and Instagram, and easy theme customization options. It also allows you to add an online store to your website using WooCommerce. Auto Trader is designed specifically for car dealerships, used car dealers, and car repair websites. It has tons of customization options which make it very flexible to match your needs. It includes unlimited color choices, custom CSS animations, multiple slider options, and a mega menu. Inside you will also find a FAQs section, pricing page, car markers, and services templates. Theme setup is quite easy with a custom theme options panel with detailed instructions. 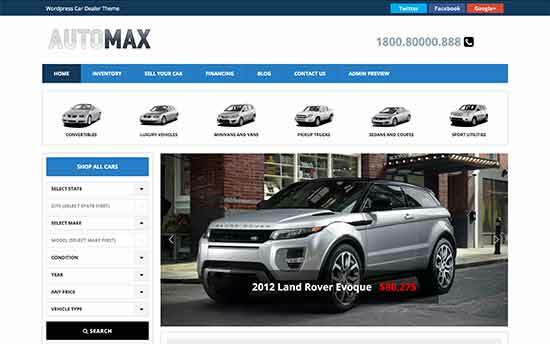 Automax is a WordPress theme designed specifically for car dealerships, auto repair, and auto traders. It comes with a vin decoder tool. This tool allows you to just add a vehicle’s vin number and then it automatically fills in all the details for you. It has beautiful templates to display your listings and a powerful search and filter system. It also includes a powerful inventory management feature to display your vehicle inventory. Other features include color customizations, custom widgets, and a built-in finance calculator. 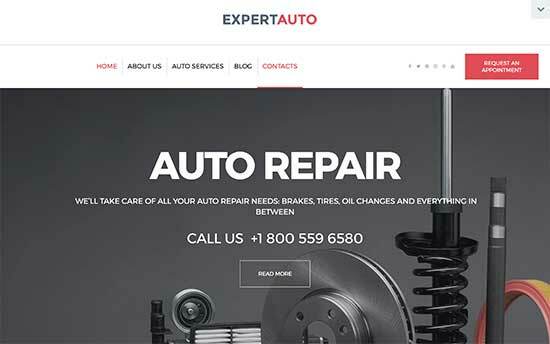 ExpertAuto is a powerful WordPress theme for car dealerships, car enthusiasts, and auto repair websites. Theme homepage features a modern layout with beautiful parallax background effects. It also includes a simple drag and drop page builder. Automative comes with a powerful vin decoder tool to easily fill in your inventory by simply entering the vin code. 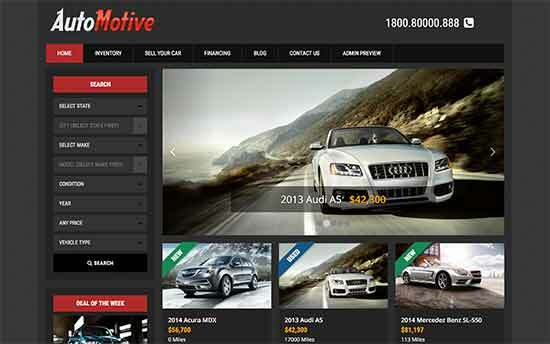 This powerful WordPress theme is designed from scratch for car dealerships. It offers unlimited colors, a beautiful slider, and a custom contact form for customer to provider their car information. Theme setup is quite easy with a custom theme options panel that walks you through the setup process. Looking for a beautiful WordPress theme with minimalist approach to design? Check out Monochrome. 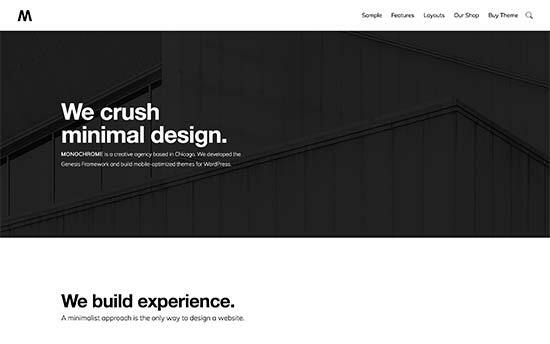 Designed by StudioPress and built on top of their powerful Genesis theme framework, Monochrome is perfect for any kind of business including car dealerships. Its clean spacious layout and gorgeous display of images makes your car photographs pop out. It is super easy to use with a widgetized homepage layout that allows you to just drag and drop widgets to setup homepage. It has beautiful templates for different pages and it is WooCommerce ready out of the box. 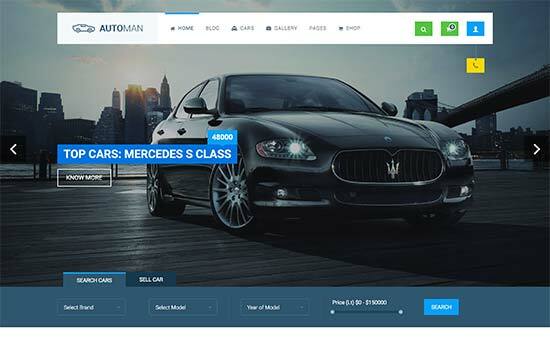 Automan WP is a beautifully designed WordPress theme for car dealership websites. It comes with a custom plugin to add car listings, and add a search and filter feature. It features a beautiful modern homepage layout with smooth CSS animations, parallax, and smooth scrolling effects. Other notable features include multiple color schemes, page templates, sidebar generator, shortcodes, icon fonts, and more. It has a custom theme options panel to setup your theme and ships with a premium page builder plugin to create additional custom page layouts. 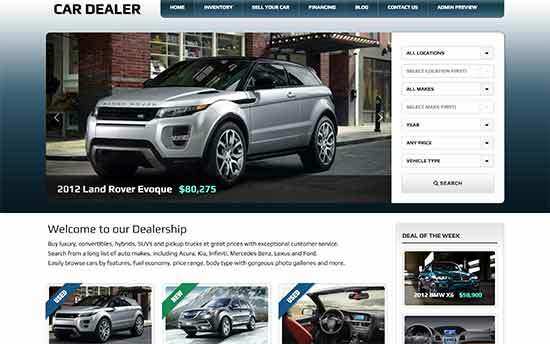 Car Dealer is a powerful WordPress theme custom made for car dealership websites. It allows you to easily add vehicle listings to your website with photos and detailed information. It has a vin decoder tool that fetches vehicle information and automatically fills information into your listings. It is easy to setup and has a simpler theme options panel. It has beautiful templates for single cars, with gorgeous photo galleries, sliders, and detailed vehicle information. It has unlimited colors, custom templates, social media integration, and custom request information contact form. 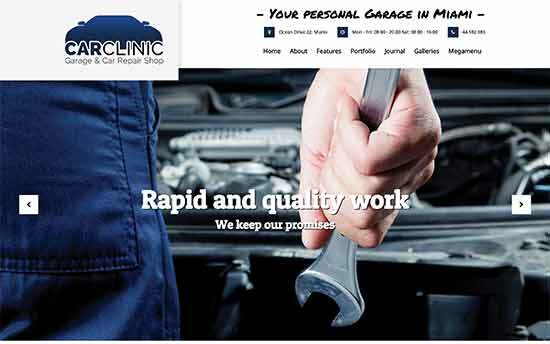 Car Clinic is modern WordPress theme for car repair, dealerships, and used cars websites. It is highly customizable and allows you to import demo content with a single click. After that, just replace the images and content with your own and you are good to go. Other features include custom logo upload, Google Analytics integration, social media, unlimited sidebars, and more. It also has staff profiles and customer testimonial sections and an easy to use theme dashboard. 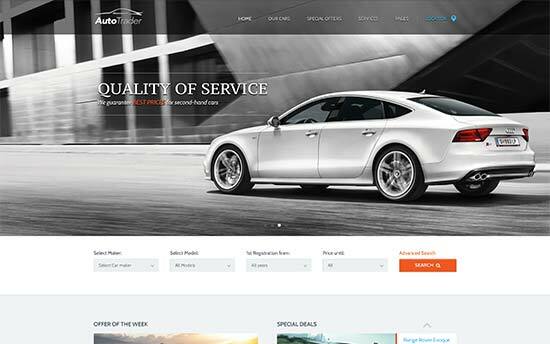 Bennet is an elegantly designed WordPress theme for car dealerships, mechanics, and car services websites. It comes with an easy to use drag and drop page builder with content blocks quickly build your own page layouts. It has ready to use templates for your homepage, blog, and landing pages with multiple layout choices. On top of that, it also ships with a simple appointment booking system as well. If you are looking for a simpler and free option, then take a look at The Automobile. It is a free WordPress theme with a decent set of customization features. It allows you to easily add your business address and phone number at the top. 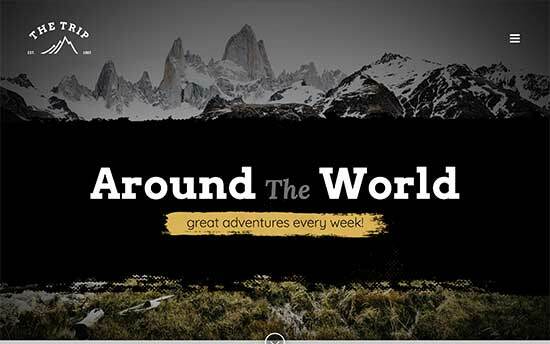 It has a modern homepage layout with different sections, animations, and scrolling effects. All theme options can be easily setup using live theme customizer. It is also compatible with most popular page builders. 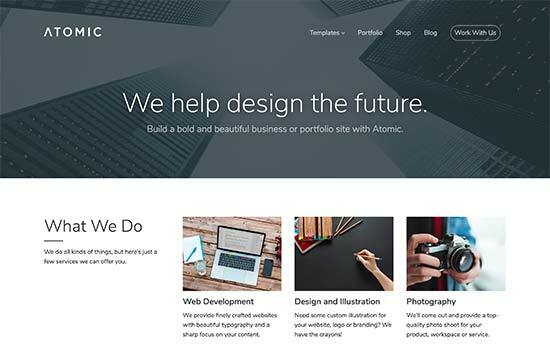 Atomic is an elegant and modern WordPress business theme. 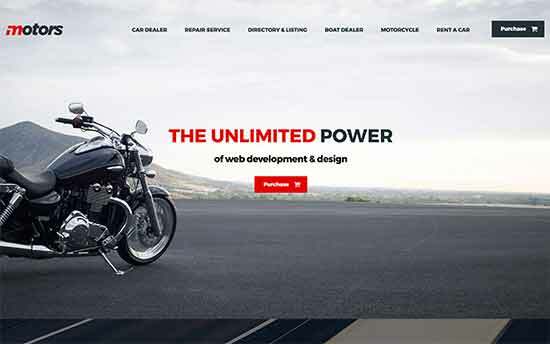 The most notable feature of the theme is its crisp typography and beautiful display of images, which makes it ideal for car dealership website. It comes with elegantly designed portfolio templates that can be repurposed to use for car listings. Atomic is also super easy to use and includes only the features you will actually use in a clutter free setup. 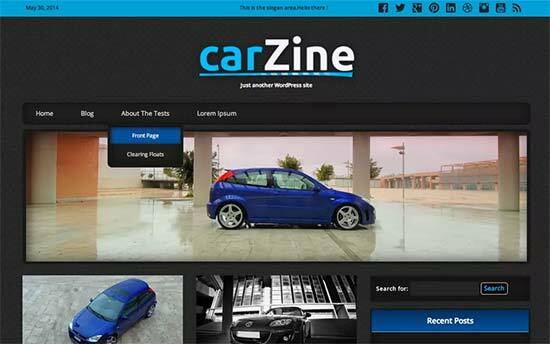 As the name suggests, CarZine is a free WordPress theme for car magazines, blogs, and dealerships. It comes with a simple theme features panel where you can upload favicon or site icon, custom logo, add social profiles, featured content slider, and more. It comes in a dark color scheme but you can also change colors to meet your own needs. It also supports live customizer to add widgets, navigation menus, and customize homepage. 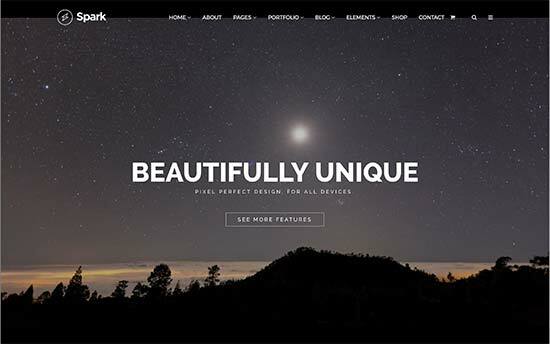 Spark is feature rich WordPress theme designed to be easily repurposed for any kind of website. Its flexibility and tons of customization options make it an ideal candidate for car dealership websites. It is available in boxed and full-width mode with many layout choices. It comes with freebies like premium slider and page builder plugins. It is also ready for eCommerce with full WooCommerce support and beautiful product templates. 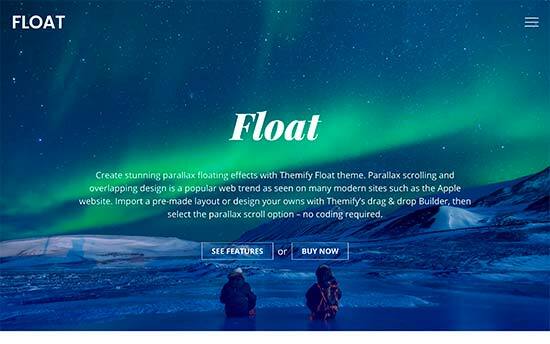 Float is a multipurpose WordPress theme with an integrated drag and drop page builder. It has multiple header styles, layout choices, page templates, custom widgets, and more. All these features make it a great choice to build a car dealership website. To make things even easier, it also includes several readymade websites that can be installed with 1-click. It is quite easy to setup with a simpler theme settings page. The Core is a bundle of readymade turnkey WordPress designs packed inside a mega theme. Simply select a website you’ll like to use as an starting point, and it will fetch all its content. It has an integrated page builder so changing page layouts or even creating new ones is a breeze. It has dozens of page styles, blog layouts, templates, custom widgets, and more. It also supports easy color selection and live theme customization. 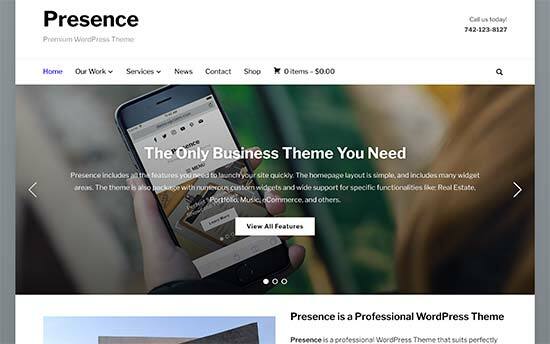 Presence is designed for businesses to build their online presence using a modern design. 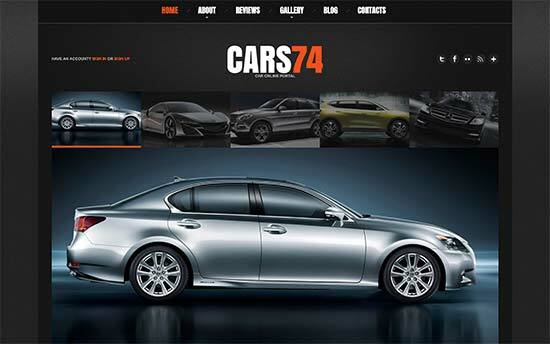 Due to its ease of use and flexible options, Presence is perfect for a car dealership website. It comes in multiple color schemes, and you can also create your own color schemes. The homepage features a business layout with a slider and navigation menu on top, followed by your services and other sections. It has 10 demos that you can install and all theme options can be easily changed with simple controls. Cherry is a multipurpose WordPress theme with three websites packed inside it. One of the demo websites is for car repair, and dealership websites. It includes multiple styles, layouts, and page templates allowing you to mix and match to create highly engaging pages. Other features include Google fonts, icon fonts, social sharing, and WooCommerce support. It can also be used to create multilingual websites using WPML. 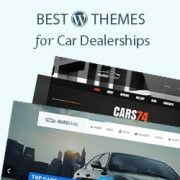 Car Dealer is a dark WordPress car dealership theme with a unique design. The homepage features a large slider at the top, which is followed by your most important content. It has full width page template, single post template with a right sidebar. It has a portfolio section that can be used to showcase your car listings. It also has templates to display your photo galleries. Other features include team, services, and testimonials sections, and WPML support for multilingual websites. 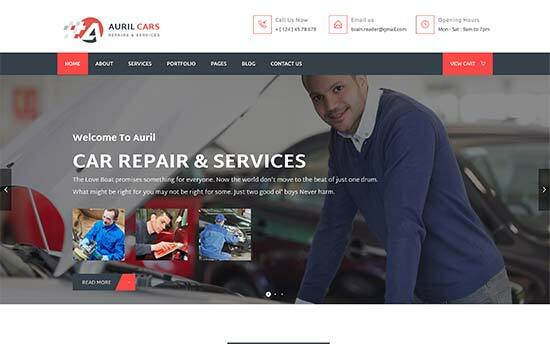 Auril is a clean and well designed WordPress theme for car repairs, dealerships, and automobile blogs. It comes with a plethora of options and 18 predefined skins. You can also create your own skins using the page builder. It is translation ready and compatible with WPML multilingual plugin. Other notable features include business hours widget, services and portfolio sections, icon fonts, and WooCommerce support. We hope this article helped you find the best WordPress themes for car dealerships. You may also want to see our list of must have WordPress plugins for business websites. Such a great article, thanks for sharing with us!! !